High iron soluble feed with magnesium. 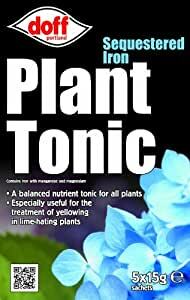 To be applied as a general tonic, though is particularly suitable for Lime-hating plants. Single dose sachets for easy use. 5 x 15 g sachets per carton. 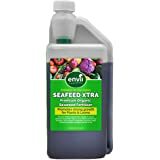 An excellent product! For years I was wondering what I need for my yellowing leaves of camelia, and only now I have realised, having watched a clip from Gardeners' World - on line, that this is what I needed. 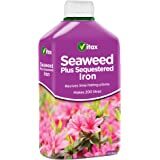 Easy to use and solves the problems, if your soil does not contain enough iron and other vital minerals for this plant! 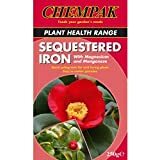 Have used sequestered Iron in powder for in the past with good results with yellowing leaves on camellias etc, so I know this product works. It was a different company making it then (Murphys I think) and was pleased that I could still get hold of it this time by Doff, who also produce a good range of insecticide may I ad. Easy to use just add it to water in watering can and off you go! This product is amazing! I had three very poorly plants and this tonic has given them a new lease of life. 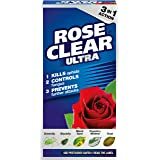 In the directions it says may have to give a second dose for some plants and mine did but they are super now. I will be coming back to this seller again! Having 5 packs keeps the tonic dry until needed works wonders though we were hit hard by the beast from the east & then the heat. Was very pleased with the Sequestered Iron Plant Tonic. I think it has replaced a previous type of product but was pleased that it was the same type of product.